The CH-46 Sea Knight, affectionately known as the “Phrog,” will make its last appearance at the 2014 Marine Corps Air Station Miramar Air Show this weekend. The venerable CH-46 first flew in October 1962 and entered combat in Vietnam in 1966, where it became the backbone of the Marine Corps helicopter fleet. The much-loved Phrog is being replaced by the much more capable MV-22 Osprey. 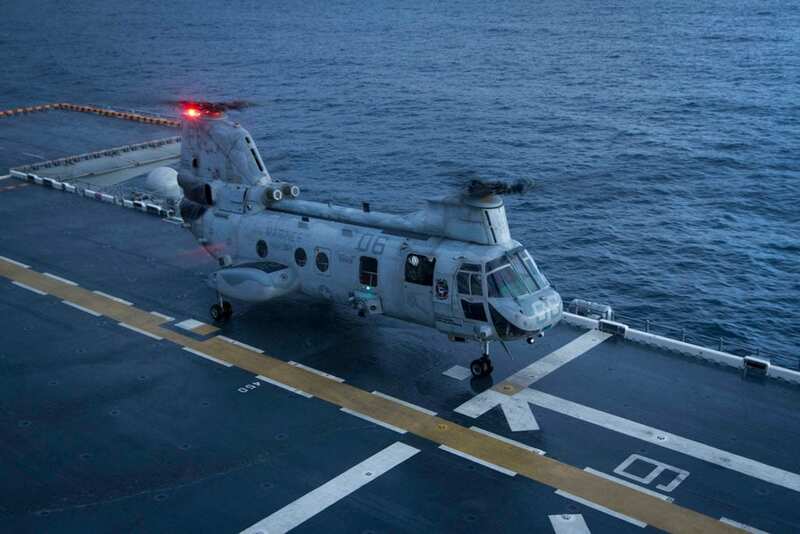 The Purple Foxes of HMM-364 brought an end to the Phrog’s 50 years of forward operations for the Marine Corps when they landed aboard the future amphibious assault ship America (LHA 6) on her maiden transit. The last squadron to deploy with the CH-46E Sea Knights outside the United States was Marine Medium Helicopter Squadron 364. 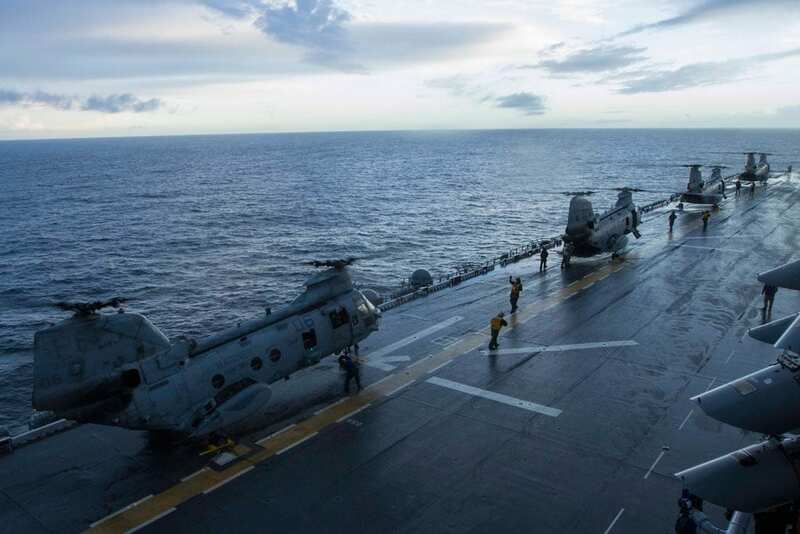 The Purple Foxes of HMM-364 brought an end to the Phrog’s 50 years of forward operations for the Marine Corps when they landed aboard the future amphibious assault ship America (LHA 6) on her maiden transit. HMM-364 recovered aboard the pre-commissioning unit America after the unit’s completion of the multi-lateral humanitarian assistance and disaster relief exercise Partnership of the Americas 2014. Four CH-46Es of HMM-364 supported the exercise by carrying Marines and disaster relief supplies from the Chilean navy LHSD Sargento Aldea to a landing zone in Pichidangui, Chile. The Phrogs were then embarked aboard PCU America for the voyage to San Diego and into permanent retirement. By contrast, America will be commissioned in San Francisco Oct. 11 as the Navy’s newest amphibious assault ship, the first of its class of flush-decked amphibious assault ships optimized for air operations, trading the typical well deck for more hangar space. With the retirement of HMM-364’s CH-46Es, Marine Medium Helicopter Training Squadron 164 will be the sole remaining operator of the Sea Knight. The squadron is scheduled to transition to the MV-22 by April 2015. UPDATE: Col. Joseph B. Bricklemyer, assistant wing commander of the 4th Marine Aircraft Wing, contacted us to point out that HMM-164 is NOT the sole remaining operator of the Sea Knight. HMM-774 “Wild Goose,” a reserve squadron operating out of Norfolk, Virginia, will operate the CH-46 until August 2015. Col. Bricklemyer and commenter James Cochran also pointed out that HH-46 “Pedros” are also operating out of Cherry Point, North Carolina for SAR duties. We regret the oversight.